The findings are the latest to link breakfast to better heart health. They suggest that people who eat breakfast -- especially a hearty one -- are less likely to harbor plaques in their arteries. Plaques are deposits of fat, calcium and other substances that can build up in arteries, causing them to harden and narrow -- a condition called atherosclerosis. Atherosclerosis can lead to heart attacks, strokes and other complications. The new study does not prove that skipping breakfast directly harms people's arteries. "It's not that you skip breakfast, you get plaques," said senior researcher Jose Penalvo, of Tufts University's Friedman School of Nutrition Science and Policy in Boston. But, he said, there are several reasons that forgoing the morning meal could contribute to the risk of atherosclerosis. Could eating breakfast boost heart health? For many people, skipping breakfast is part of a "cluster" of bad habits, said Penalvo. These people tend to eat out a lot, and opt for nutritionally dubious convenience foods, for instance. On top of that, Penalvo said, skipping breakfast may have negative effects on appetite-regulating hormones, blood sugar and insulin (a hormone that regulates blood sugar). Prior studies have shown that breakfast fans are less likely to be obese or have diabetes or heart disease. But the current study actually used objective tests, Penalvo said. The researchers used ultrasound to screen middle-aged adults for "subclinical" atherosclerosis -- early plaque buildup that is not causing any symptoms. The study included more than 4,000 adults ages 40 to 54 from Spain. Three percent were chronic breakfast-skippers, while 27 percent regularly had a big breakfast. That meant they ate more than 20 percent of their daily calories at their morning meal. Most people -- 70 percent -- ate a relatively low-calorie breakfast. It turned out that those three groups also differed in their odds of subclinical atherosclerosis. Nearly 75 percent of breakfast-skippers showed such plaque buildup. That compared with 57 percent of people who ate a big breakfast, and 64 percent of those who favored a light one. Breakfast fans were healthier in many ways, the study found. They generally ate more fruits and vegetables, seafood and lean meat, for instance. They were also less likely to be obese or have high blood pressure, diabetes or unhealthy cholesterol levels. But even with all those factors weighed, breakfast-skipping, itself, was still tied to a higher risk of atherosclerosis. Kim Larson is a registered dietitian and a spokesperson for the Academy of Nutrition and Dietetics. She said the findings are important, in part, because many adults -- around 30 percent -- routinely skip breakfast. And some people, she noted, purposely cut out breakfast when they're trying to lose weight. That's a bad idea, Larson explained, because of the effects on appetite and eating habits the rest of the day. "People who skip breakfast generally make up for it later in the day," said Larson, who wasn't involved in the study. In the end, she said, they typically down more calories over the course of the day, versus people who eat breakfast. The current study did not dig into the nutritional quality of people's breakfast choices. But when it comes to preventing disease, Larson said, "quality matters." A bagel and coffee is "better than nothing," she noted. However, Larson recommended that breakfast include a healthy mix of protein, carbohydrates and fat. She acknowledged that time is an obstacle. Many people are rushed in the morning and end up eating a muffin in the car. But breakfast does not need to be extravagant to be healthy, Larson said. Some of her suggestions: oatmeal with nuts and fruit; whole-grain toast with nut butter; granola mixed with yogurt and fruit; and apple slices with peanut butter. 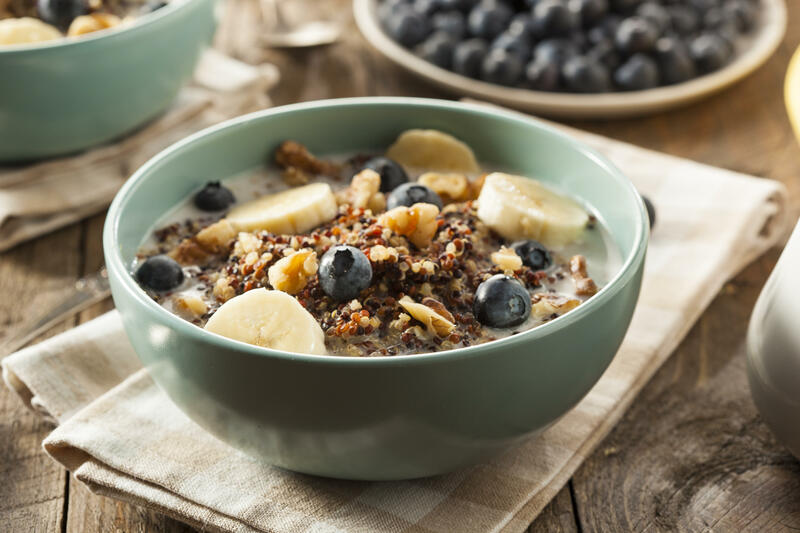 Penalvo encouraged people to look at it this way: Eating a healthy breakfast is actually an enjoyable way to potentially curb your heart disease risk. "This is a really positive message," he said. Of course, breakfast is not a stand-alone solution. Penalvo said it should be part of a generally healthy diet and other good habits such as regular exercise.